Chiang Mai succeeds in combining a long and fascinating history with the needs of a modern population. The number of visitors to the city has dropped recently, so hotel room rates are very competitive at the moment. With other destinations such as Chiang Rai, Mae Hong son and the celebrated Golden Triangle a relatively short distance away, Chiang Mai's role in the future of tourism in this beautiful, unspoiled area of Thailand is assured. Many rivers flow from the northern mountains across the Central Plain. The chief river, the Chao Phraya, enters the Gulf of Thailand just south of Bangkok. Many farmers sell their produce at floating river markets. Wat Phra That Doi Suthep is 3051 feet above sea level, the temple and gold covered chedi can be reached by climbing the 300 steps which are flanked by two seven-headed nagas. The chapel or viharn of this particular temple is a good example of Lanna Thai architecture. The viharn houses Phra Buddha Sihing, which is a Buddha statue highly revered by the local people. This spacious temple has the largest viharn in the northern province. 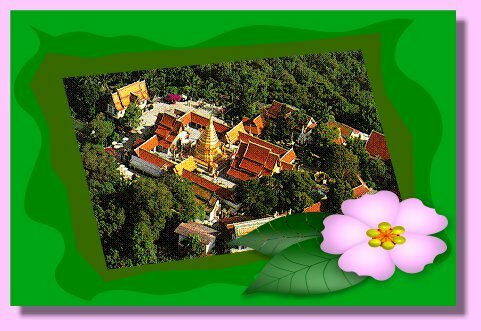 There are a number of small chedis which house the ashes of Chiang Mai's royal families. The largest of the chedis is said to have no less than eight Buddha relics inside.